Ajai Chopra, Chief Negotiator with the IMF, reveals that his group would have backed such a move – but the European partners in the bailout would not. THE CHIEF NEGOTIATOR for the International Monetary Fund (IMF) has said that his organisation told the Irish Government it was in favour of burning senior bondholders at the time of the bailout. We looked at the matter… of how burden sharing should be done and if certain conditions were (met), we thought sharing the burden with unsecured senior creditors of banks was an option that ought to be explored. In June of this year, current Finance Minister Michael Noonan had threatened to impose losses on some senior bondholders, at Anglo Irish Bank and the Irish Nationwide Building Society, to the tune of €3.5bn. He said at the time that the IMF supported the strategy. Chopra’s interview tonight with Prime Time’s Robert Shortt shows that the IMF had been advising that strategy of imposing such a haircut on bondholders as far back as last year, when Ireland had to seek a bailout from the EU/IMF/ECB troika. 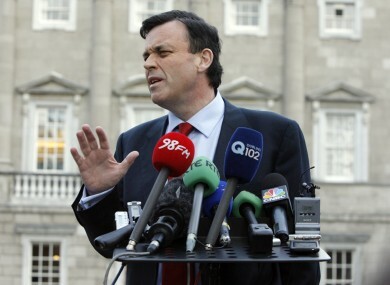 The late Brian Lenihan was Finance Minister during those discussions. (Noonan said in the Dáil this month that Fine Gael never promised unilaterally that it would burn senior bondholders). However, the European Central Bank is known to be still firmly against such a course of action. Noonan told the Dáil on 15 November that the ECB would need to approve burning senior bondholders at the financial institutions and that “the ECB’s consent was not forthcoming”. One of Brian Lenihan’s economic advisors, Alan Ahearne, and EC bailout negotiator István Pál Székely both confirmed last night that the ECB had been against burning bondholders in November 2010. The Prime Time programme also reported that US Secretary of the Treasury, Timothy Geithner, was not in favour of Ireland making senior bondholders sustain losses. This stance by Geithner and his colleagues was confirmed by Székely. Email “IMF was in favour of Government burning senior bondholders”. Feedback on “IMF was in favour of Government burning senior bondholders”.